The Boomerang Plus can be considered one of the most accessible electric bicycles ever, making riding more fun and easy for everyone. The Boomerang features a 9" step-through frame that allows easy access for those with knee, back, or hip problems. If you also have some joint problems, you'll appreciate the geared motor that excels at acceleration and hill climbing. You'll find yourself naturally cruising upright in a straight position with the wider handlebars. The Boomerang Plus is the upgraded kin, the Boomerang. The Plus comes equipped with Balloon Tires and upgraded saddle and grips. The Pedego Boomerang Plus is the upgraded kin of the Boomerang. Enjoy Balloon Package, Kevlar-belted tires, five levels of pedal assist, and a deluxe saddle with a suspension seat post. Experience a smoother ride with the wide, swept-back handlebars and easy pedaling with the Shimano seven-speed. 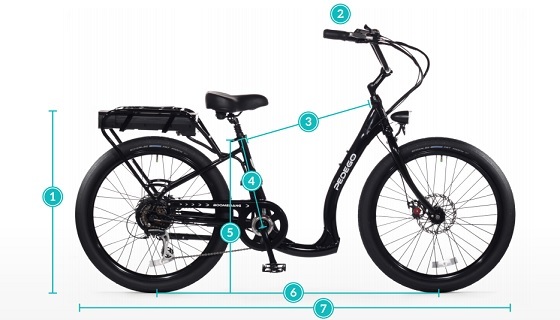 The Pedego Boomerang Plus has the option of a 48V 10Ah or 15Ah battery. The 48V 10Ah is a powerful battery, perfect for riders over 200 pounds and great for overcoming strong headwinds or steep hills. The 48V 15Ah battery is the best of both worlds, with the powerful option of the 48V battery and the long-distance of the 15Ah (similar to the range of the 36V 15Ah). Mag Wheels are designed for larger riders, and it's essentially a beefier tire to allow the rider to have a smoother ride while elongating the lifetime of the wheel and bike. 31 in. 25 in. 23.5 in. 23 in. 27 in. 47 in. 74 in.